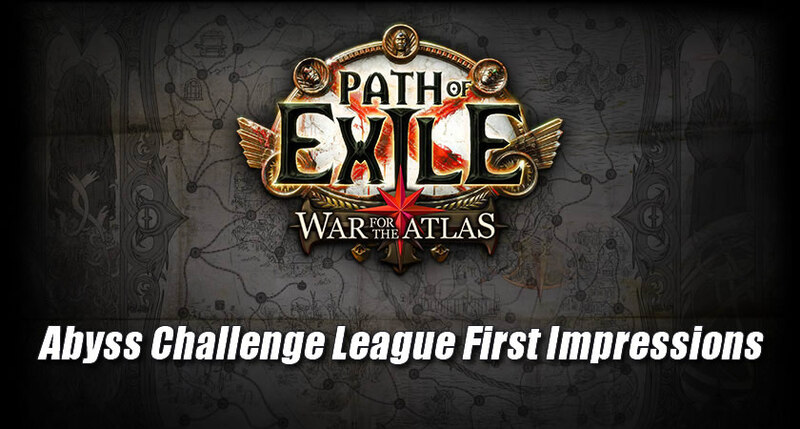 A few days have passed since Grinding Gear Games released the long awaited 3.1.0 patch which launched the Expansion War for the Atlas, and the Abyss Challenge League. While it's still far to early to map out the entire functionality changes to the end game, it is entirely possible to speak about the changes made regarding the new challenge league and miscellaneous patches. While I usually attempt to maintain a level of professional decorum, this article will be about my personal experience with the 3.1.0 Path of Exile update, and currently my personal experience lacks perspective on the endgame War for the Atlas content. With that disclaimer out of the way, lets take an analysis of the other changes. Here's a big one for players like myself and many others whenever a large update, or expansion is released: "How quickly can I interact with this new content?". Well there is a duality to that question with the 3.1.0 update, the Atlas is still end game content, the direct changes to the map are obviously only accessible once you've completed the Tenth Act and have entered the Epilogue. However the content added with the Abyssal league is available directly after you reach Lioneye's Watch you can start to find Abyssal fissures. Compared to the many challenge leagues I've participated in before, the Abyssal fissures seem to be extremely abundant. I would say that I have encountered nearly twice the number of Abyssal fissures than I encountered harbingers in the previous league. While I have only had one fissure turn into an Abyssal Depths portal, I would imagine that they are more common in the later acts, I had encountered mine during act five. Overall gauging from my experience, unless someone happens to get horribly unlucky, the possibility of encountering the new Abyssal content is extremely high immediately once you begin Act 1 and leave the Twilight Strand. It seems as if I ran through acts 1-5 faster than usual cutting my previous time down nearly by half. I think this was possible from the equipment rewards from these fissures, I was swimming in gems, rares and even a couple unique items before I hit act three. While not as important as the new challenge league or Atlas changes, there have been some minor elements to PoE changed in this patch I thought were slightly noteworthy. The tutorial change although irrelevant to me directly since I've been playing PoE on and off since the beta, is still a nice change for newer players. I could see how certain concepts could have been difficult to grasp for those unfamiliar with ARPG's. Even more so for console players I believe it was a professionally good thing to bring it's tutorial into the modern era. Post 3.1.0 patch I have noticed in certain areas that lacked any large numbers of mobs have no been populated to an acceptable fashion. Such as the Blackguard barracks, which used to be rather empty if I remember correctly. While the barracks isn't the only place that has had more creatures added to it, it was in my opinion an extremely prominent area that lacked the swarm of foes other regions had. This change helped out the pacing both in terms of game play, but also item progression which sometimes could be thrown off with strange lulls in the action. While last on this short list, but certainly not the least is the changes made to Divination cards. Before the 3.1.0 patch I would say that I would usually start dropping divination cards around act four, but that was very uncommon even then. After this patch however I was finding the uncommon Divination card here and there in act two and three, which them becoming slightly more common past act four. I appreciate these changes since divination cards had always seemed so nearly non existent until you reach the absolute end game, this will add even more variety to the earlier acts of PoE. Overall I have personally found the 3.1.0 patch rather interesting. I think its a fantastic time for newer players to begin with the new league, and for older experienced players to return and re-learn the game. So let's have another go:Get Exiled, Burn Oriath Repeat.